Save big: Individually all 5 together cost $87.75, but sell as a complete system for just $49.95. Receive bonus booklet: "The Car Detailer's Guide to Strain Removal." Step by step instructions for removing stubborn stains caused by ink, mold, food, chewing gum, and extra tips on odor removal. Add extra profits: stain removal is a "niche" service that a lot of detailers don't offer. Profit an extra $15, $50, or even $100 per car. Stain Blaster: A versatile, all-purpose stain spotter. Profit: $10 – $15 per stain, or build in an extra $20 – $50 to a detail. Remove any spilled materials from the carpet surface. Apply Stain Blaster directly to the stain. Repeat if necessary but do not over use spotter and be sure not to saturate the carpeting. In this booklet, you__ll learn tips and tricks for removing stubborn stains caused by ink, mold, chewing gum, and more, as well as extra tips on odor removal. Pet Stain & Odor Remover: use the power of enzymes. Specifically formulated to remove stains and odors caused by pet and human feces, urine, vomit and other organic related stains and odors. The bio-enzymatic action breaks down organic materials, eliminating stains and odors easily! Profit: $50 – $200 per car. Remove any organic materials from the carpet surface. In the case of wet urine, blot before spotting by taking a clean, white cloth or paper towel and placing the folded towel over the dampened area and standing on it. . Reposition to a dry, clean area of the towel and repeat until the urine is removed. Apply Pet Stain & Odor Remover directly to the stain and allow to stand for a few minutes. If odors are still present, apply a generous amount of Pet Stain & Odor Remover to the area after spotting and allow to air dry. If odors are not present rinse the cleaned area with a small amount of clean water and blot dry. Repeat if necessary and allow area to dry completely before using. Juice & Red Stain Remover: Say _yes__ to food dye stains. Vivid colors and dyes are common in children__s foods, beverages and medications, creating tough stains in your customers__ cars. Also does an amazing job on fruit juices and other colored drinks. Excellent for removing wine stains as well. Profit: $30 – $50 per stain. Test carpeting for colorfastness in an inconspicuous area. Apply Juice & Red Stain Remover directly with a clean, white cloth or cotton swab. Using a wetted cloth or swab, apply Juice & Red Stain Remover to stain from the outside edge toward the center of the stain. Repeat if necessary but do not over use Juice & Red Stain Remover and be sure not to saturate the carpeting. 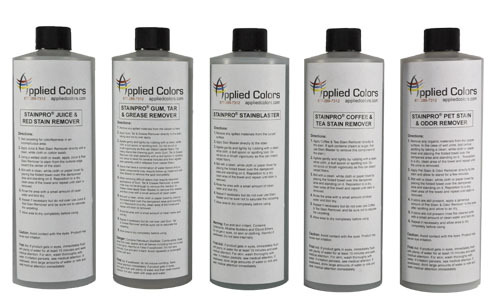 Coffee & Tea Stain Remover: don__t just _lighten__ coffee stains. Eliminate them. Other types of yellowish or brown _tannin__ stains. Profit: $15 – $25 per stain. Gum, Tar & Grease Remover: less toxic than strong solvents. When oil-based, greasy, gummy, sticky spots happen, Gum, Tar, & Grease Remover is the answer. As a citrus-based stain remover, it removes most oily stains and spots with ease. Also provides excellent results on crayon, lipstick, shoe polish, wax, inks, adhesives, glues and many other oil based stains. Profit: $10 – $20 per stain. Apply Gum, Tar & Grease Remover directly to the stain, taking care not to over apply. Agitate gently and lightly by rubbing with a clean, white cloth, a dull spoon or spotting tool. Do not scrub or brush vigorously as this can distort carpet fibers. For heavy stains like chewing gum, work Gum, Tar & Grease Remover into stain patiently with a dull spoon or spotting tool, allow to dwell for several minutes and then agitate stain patiently until it releases from carpet fibers. Stains that have a combination of water-based and oil-based components may require follow-up treatment with Stain Blaster to remove the spot completely. When removing difficult stains that require repeated applications of Gum, Tar & Grease Remover, a water rinse may not be enough to remove the residue. In theses cases apply Stain Blaster to remove this residue and then rinse with a small amount of clean water. Repeat if necessary but do not over use Gum, Tar & Grease Remover and be sure not to saturate the carpeting. Click the button below to add the StainDetailer__ Chemical System to your wish list.